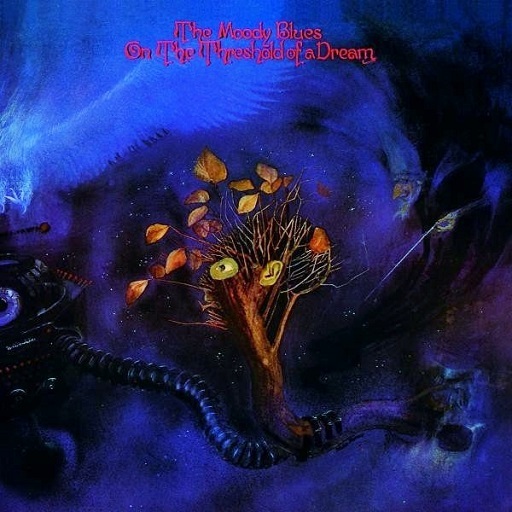 Having recently announced that I am dialing back my writing time a bit, it behooves me to show I’m still alive and kicking by expounding on a musical topic long dear to my heart: The Moody Blues! The Moodies occupy a somewhat uneasy place in the rock pantheon. The band boasts millions of fans who hang on every note of their meticulously crafted recordings. From the late sixties through the early seventies, the Moodies blazed an astonishing creative trail with great album after great album that pushed the boundaries of what rock music was and should be. And yet when you hear the names of greatest musicians of that era reeled off, the Moodies are rarely among them. Why is that? Well, my theory is that rock critics, those who control the minds of feckless music fans who wish to be influenced instead of doing their own research, clearly had it in for our heroes. 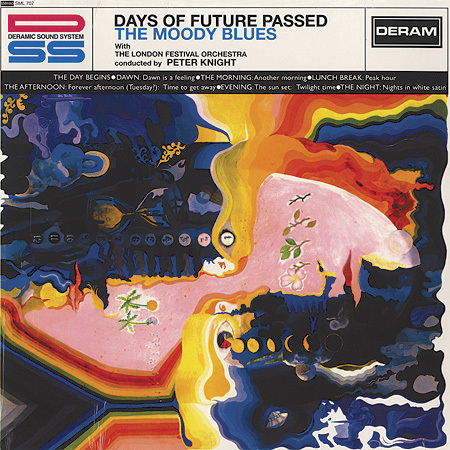 The Moody Blues made one of the first rock concept albums. They were the first to add orchestral instrumentation to rock. They experimented with new recording technologies and instruments (the mighty Mellotron!). The vocal harmonies on their albums are often so wild, they make The Bee Gees and Beach Boys sound amateurish. They were deep thinkers (and presumably still are) who, while they could write a nice love song, also enjoyed investigating deep philosophical themes. With all this, you’d think the Moodies would at the very least have a place next to Genesis and King Crimson and Pink Floyd in the prog pantheon. And yet, despite a massive audience of PBS-watching Americans of a certain vintage, the intelligentsia seems to lack appropriate appreciation, and you rarely see some ultra-cool person reference their music as a touchstone. “Respected” critics of dubious intent gleefully tear the band’s core discography to shreds, much like they do that of Jethro Tull, another seventies band of great artistic achievement. The other part of my theory? The Moodies were just too nice. They were friendly British guys interested in ideas and stuff. They were pretty clearly not shooting up or living on the dark side in any way. They liked music to sound beautiful, even pretty. They preferred to uplift rather than frighten. Don’t get me wrong, I have my Magma albums and my Henry Cow albums and Xenakis and all sorts of nasty things littered throughout my collection; I like edgy and dark. 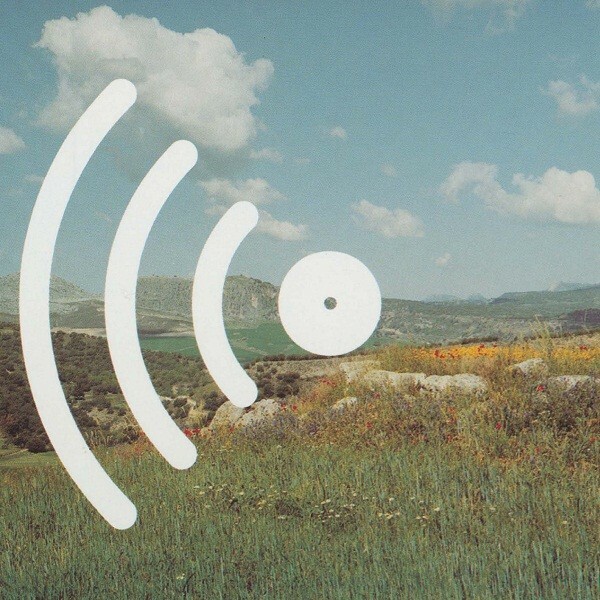 But there is a place in this world for music that sounds …. well, kind. 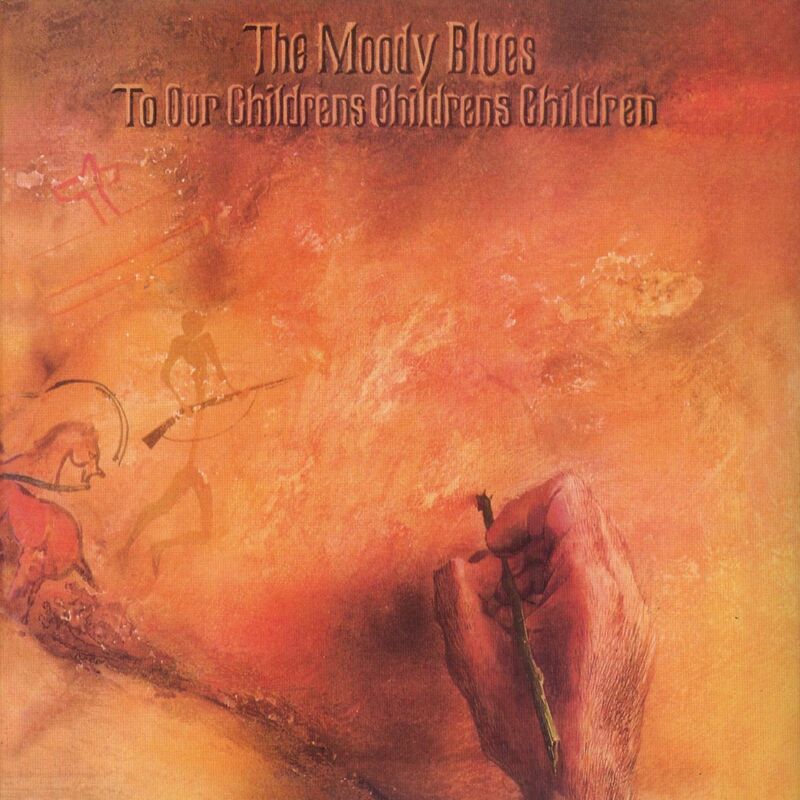 The Moody Blues made and make kind music. It is the least punk-rock band of all time, and I love it for that. 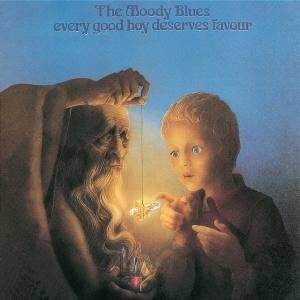 This isn’t to imply that The Moody Blues should feel hard done by; millions of fans and the respect of critics who know what they’re talking about (like me!) are no doubt plenty of solace. I just don’t feel they get their due. It was a very democratic band, with each member getting to write; Mike Pinder, the keyboardist, was the deep philosopher and the band member most likely to step over to the darker side of speculation. Justin Hayward, guitarist, was the romantic, with his keening voice and yearning lyrics. John Lodge, bassist, was more playful and generally also came the closest to actually “rocking”. Flautist Ray Thomas’s songs are so playful, at times they come across almost with the same innocence as children’s music. Which, when in the context of one of their magic carpet albums, actually makes sense. And underrated drummer Graeme Edge contributed the odd piece of eccentric spoken word. 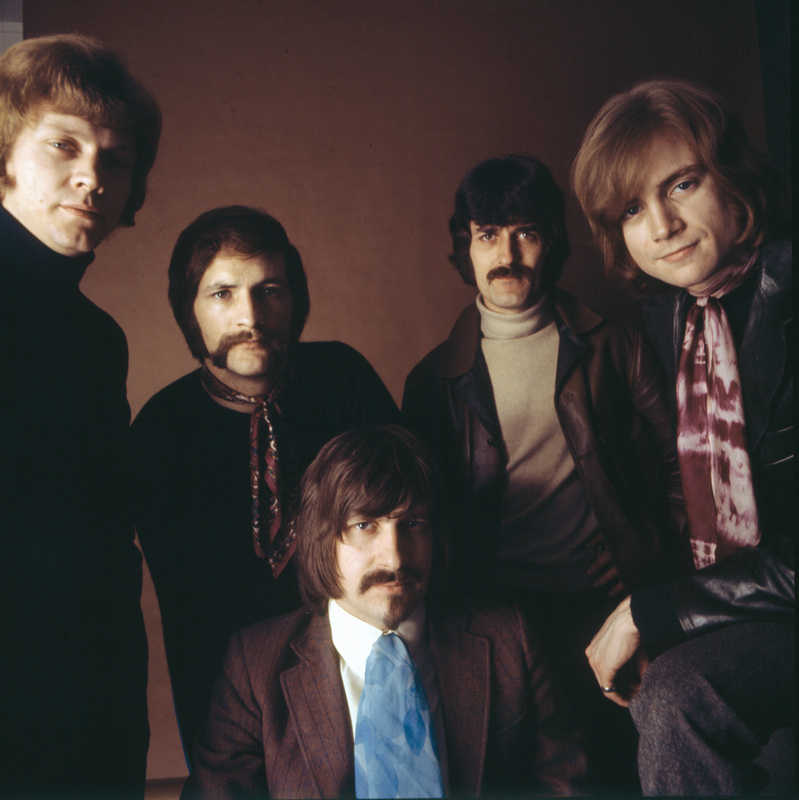 In essence, then, The Moody Blues were the questing spirit of the late sixties and seventies, and the band’s core discography accurately reflects the changes in society and in music as they unfolded. But remember, this band was doing as much to create these trends as The Beatles, Kinks, Stones — you name it. They were musical leaders, not followers, and if you can’t get on board because the Moodies preferred to smile rather than leer, then the heck with ya. These seven albums, released in short order one after the other over a period of five years, represent the band’s core discography and commercial heyday, though another brief heyday followed in the early eighties with the mega-success of the Long Distance Voyager album (1981), as well as some further hits like “In Your Wildest Dreams” and “I Know You’re Out There Somewhere”. Those tunes are an edgy, hip type of person’s worst nightmare, but I love ’em for it. Gimme some kind, humane music any day. 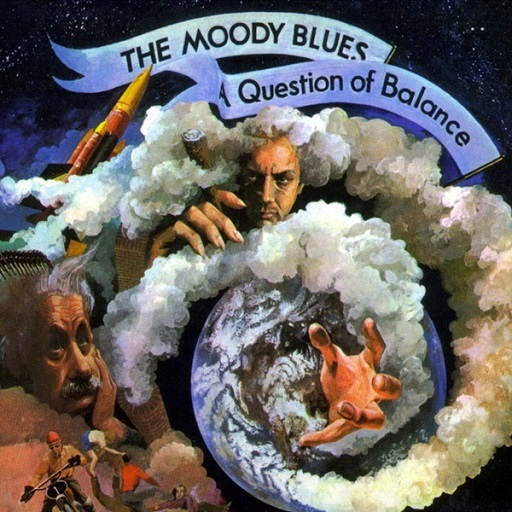 The Moody Blues had been a pretty standard beat group best known for departed axeman Denny Laine’s “Go Now” (he’d resurface as McCartney’s guitar support in the oft-woeful Wings). Laine was replaced by superlative talent Justin Hayward, and no offence to Denny, but the world has cause to be grateful. 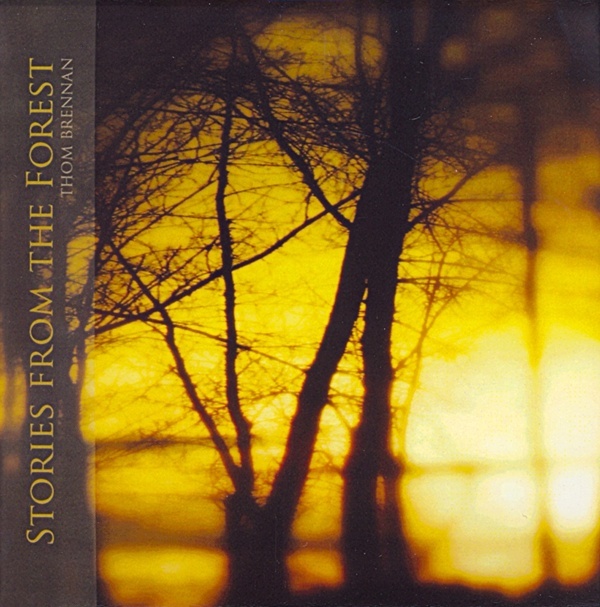 Fortune called when label Deram asked the band to record some classical music to help demo some recording techniques. Instead they recorded an album of original music aided by the London Festival Orchestra. This seems pretty ho-hum as an idea today, but you have to remember that at that time pop bands were still perceived as not making “serious” music. Collaborations between rock musicians and classical players were unheard of, so this is a truly ground-breaking affair. To be honest, a lot of the songs are a little forgettable, though they do serve to aid in the exposition of the album’s concept (a single day in a life). No one’s entering “Peak Hour” or “Twilight Time” in the canon of rock greats. Still, the way the songs melt into and meld with the orchestra is quite a trip; it’s rare that you can pinpoint the start of something, but yes, symphonic prog started right here! Aside from that novelty, the album should be best known for introducing a great talent: Justin Hayward. On this album alone, we have the sheer beauty of “Tuesday Afternoon“, a two-parter with windswept verses joined with a jaunty mid-section. And then there’s “Nights in White Satin“, an all-time classic if ever there was one. OK, the imagery of the lovers and their white satin it a bit much, but really, he could be reciting the phone book for all I care. The music is just too glorious; his voice is the voice of the cosmos itself. The ethereal sonic haze is supremely mystical; Thomas’s flute solo is epochal; the crescendo-ing climb to heaven that closes each chorus blows the mind. Yes, that song deserves its rep in spades. This album sounds like a bit of a relic at this point, but doesn’t almost everything from the psychedelic era? The Moodies were clearly swept up in the peace ‘n love and Eastern mysticism vibes radiating from San Francisco and Ladbroke Grove. Gone is the mannered concert-hall dignity of the previous album, replaced by the sheer exultation of sonic and philosophical experimentation. It must have been a hell of a time to be a musician. Does it all work? Probably not, but you have to love the ambition. There are several classics here, including the relentless joyful propulsion of Lodge’s “Ride My See-Saw” (those high vocals are nuts! ); Thomas’s totally overblown tribute to Timothy Leary, “Legend of a Mind“, which deserves credit for being one of the first progressive rock “epics” (that slow build-up in the middle section is a wonder); the yearning stretch for the melodic stratosphere of Hayward’s “The Actor”; and Pinder’s extremely earnest adoption of Hindu philosophy on “Om”. As always with this band, when they tried to get too weird, it’s not as good (“House of Four Doors” and some of the poetry…), but really, you could say that of about a million psych and prog albums. Yes, this album is dated, but it sounds way sweeter than most of the rest of the archaeological evidence of late sixties music — I’d take it over a lot of Grace Slick’s cackling (I like her sometimes though…) or the Dead’s jamming any day. And over just about anything on Magical Mystery Tour. This is more of a transitional release; the ultra-hippie San Francisco influences of the previous album are gradually being replaced by a symphonic rock sound that would be very influential on the developing progressive rock movement. It’s actually not a favourite of mine; I like it but it doesn’t have the profound effect that other Moody Blues albums have on me. The songs are nice, though; Hayward’s “Lovely to See You”, like many of his numbers, proves what an underrated guitarist he is. There’s a purity of tone in his playing that parallels his almost unmatched purity of voice. Other songs, though, are already sounding like acid pastiche, like Thomas’s “Dear Diary”. Likewise, Lodge’s “Send Me No Wine”, sort of psych country, doesn’t sit all that well with me, but he succeeds admirably with the unpretentious rocker, “To Share Our Love“. The second side contains Pinder’s delicately groovy “Have You Heard” and one of Hayward’s prettiest love songs, “Never Comes the Day“, which apparently failed as a single, but man, is it pretty. Sweet broken acoustic chords, a fairytale melody, a big chorus and of course those beautiful ‘trons. What’s not to like? Anyway, this is a nice album but probably about the fifth one you’d want to pick up. This was the first of the band’s albums I purchased, and it remains my favourite. As a whole, A Question of Balance may be the stronger record, but this one just has a sound to it I’ve never really encountered anywhere else. The usual adjectives, “otherworldy”, “ethereal”, “cosmic”, etc., don’t seem fitting enough. And it contains about five of the most purely celestial, beautiful pieces of the band’s career. I had a reissue with liner notes in which a member stated that they were using the classical studios at their label instead of the pop ones so they could have access to better gear, and it shows in the stunning sonics. Only on, say, King Crimson’s “Epitaph” have I heard Mellotron sound as spacy as it does here (on multiple songs). The album has a loose theme of space travel and humankind’s possible development and movement beyond our solar system (probably one of many pieces of art inspired by 2001: A Space Odyssey!). Side one actually isn’t as successful because there’s some experimental stuff that is only so/so, like the messy “Beyond” and Thomas’s overly precious “Floating”, but the hazy “Out and In”, an ode to meditation, has to be one of the grooviest pieces of the entire psychedelic era. Side two is the best side of the band’s career, with gem after gem: Hayward’s widescreen “Gypsy“, with its bell-like, soaring guitar solos; Thomas’s ultra-spaced-out “Eternity Road”; the earnest hippie moralizing and sweet melody of Lodge’s “Candle of Life“; and finally, the unbelievably blissful ocean of Mellotron that is the closer, “Watching and Waiting“, which seems to be a planet’s love letter to space colonists! One of the best albums of the late sixties and therefore one of the best albums ever — your collection of psychedelia and progressive music is not complete without it. 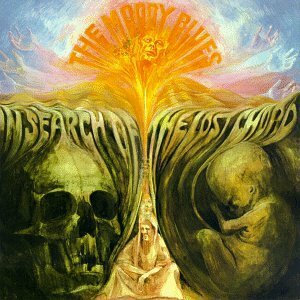 If there was an album that could be said to be The Moody Blues’ Sgt. Pepper or Dark Side of the Moon, this is it. Two sides of sheer brilliance, from the profound to the comedic to the nakedly spiritual. Each band member shines on his songs, but none more so than Hayward on “Question“, which goes through some pretty astonishing permutations: the frenzied opening verses with some really nutty background vocals, the beatific acid folksong that takes up the middle section with Hayward singing like an angel, then an outro of more crazy choral vocals and peculiar drum whacking (Edge might not get enough credit for his skills in that department). Thomas, usually the silly one, contributes the really lovely and philosophical “And the Tide Rushes In”, and even good-time guy Lodge’s “Minstrel’s Song” has a certain dignified air. Every song on this album is a winner, and the production is sublime, with washes of Mellotron, waves of multi-tracked vocals, glistening guitar tones — it has it all. The finale of Pinder’s sorrowful, dramatic “Melancholy Man” and the hippie Eastern spirituality of “The Balance” may not be for everyone, but it’s hard not to get caught up in the glory of it all. Honestly, you’d have to be kind of tone-deaf not to have some appreciation for this album’s melodic and sonic virtues. This release is kind of double-edged; on the one hand the band’s formula was showing some signs of fatigue. 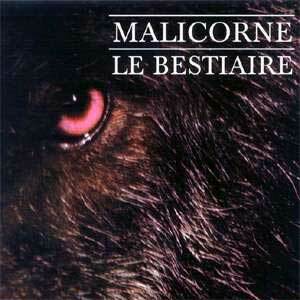 On the other, it contains several of their best songs, almost as though the tension made them more creative, not less. Mike Pinder in particular seemed to be doubting whether the sixties dream could actually become a reality, because on this album he turns in the two bleakest pieces in the band’s entire discography, “Lost in a Lost World” and “When You’re a Free Man”, featuring lyrics like: “I woke today, I was crying/Lost in a lost world/So many people are dying”. Also notable is the fact that he turned in his Mellotron for a Chamberlin, a supposedly more advanced version of the same device. (Interesting side note: Pinder worked for Streetly, the manufacturer of the Mellotron; hence his constant use of it.) The album also contains my favourite song in the band’s entire canon, “New Horizons“, which Hayward wrote after the passing of his father. Simple, direct, heart-wrenching lyrics, a soaring melody, waves of Chamberlin strings … it’s pure heaven. So much so that I recorded and recently released my own hi-fidelity version, which I really do beseech you to listen to. The rest of the album is iffy to me; Thomas’s “For My Lady” strays into full-on easy listening territory and is just too cute; Lodge’s “I’m Just a Singer (In a Rock and Roll Band)”, an answer to fans who treated the band members like all-knowing gurus, is a fun song, but “Isn’t Life Strange”, on which he employs the most peculiar sort of vibrato, is just a bit overblown and twee for me. But then we’re all different beings in this strange life, ain’t we. Thank you for this blog – article. I thoroughly agree with your assessment of the Moodies’ place in the genesis of prog rock, and that they deserve ‘better’ regard. I have been a fan since I fist heard Threshold of a Dream in 69 or early 70. Another excellent piece. ‘To Our Children’s Children’s Children’ was the first decent album I owned. My Uncle bought it for me for Christmas – everyone thought I was mad asking for it. I was only 13 and at the time not mad on music. This became part of my downfall and helped fuel an obsession. I still love it and play it regularly – I like most of ‘On The Threshold Of A Dream’ too. Reading the opening of your post reminded me of the story of Graeme Edge being asked if the band was pretentious. He replied, “Yes, I suppose we do pretend a lot!” Down to Earth or what? One man’s pretentiousness is another man’s wisdom!